The Leafs and the Raptors may be heading off to the fairways to relax, but their absence doesn’t mean their home will be going quiet. 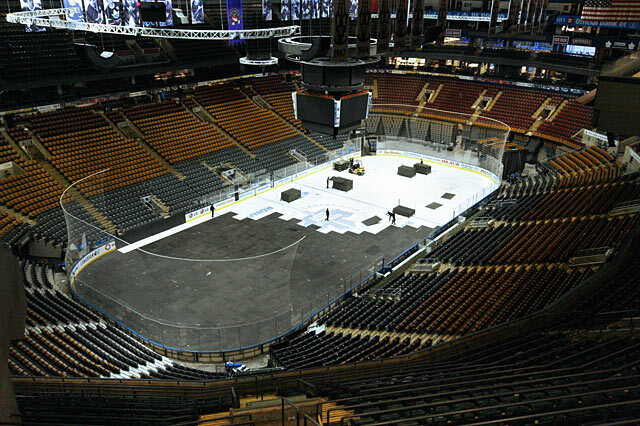 While they’re gone for the summer, the Air Canada Centre will be host to dozens of concerts and events—all of which will require the services of the building’s overnight conversion crew, the tireless team that takes the arena from hockey to basketball, from basketball to lacrosse, and from lacrosse to Lady Gaga. 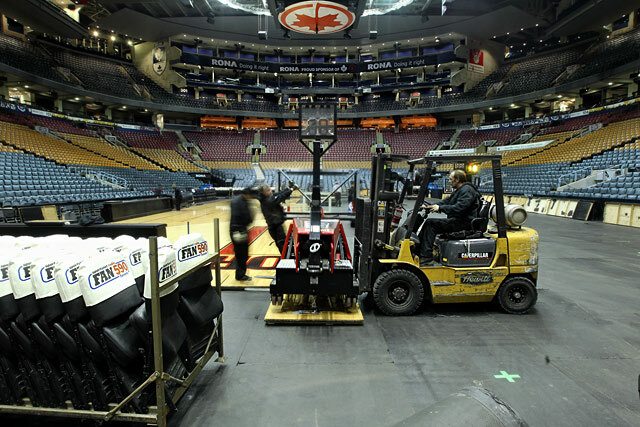 To find out just how they do it, we spent a night—all night—at the ACC, spoke to the management and crew, and took in an ice-to-court conversion. To the casual observer, the hoodies the full-time crew wear might seem a bit ubiquitous: all black, emblazoned with the word “conversions” across the front, a white outline of a dragon on the chest, and a nickname along the hood. It’s the kind of custom apparel you’d expect from a rec-level sports team: it says camaraderie, while hinting at a shared inside joke. Nobody knows we exist, members of the crew explain, laughing, as they describe the relationship they have with their daytime co-workers (or lack thereof). “When they leave it’s hockey, and when they come back it’s basketball. They don’t know how it gets done.” The job, they continue, is a mystery to most—which is why they decided on a dragon for the hoodie—a “mythical creature,” heard of, but never seen. After the ice is covered and the deck is firmly in place, the crew starts removing the glass and boards, and drops the safety nets that hang behind the goals. At the same time, the seats in the west end are manually retracted, opening an entrance to the back storage area. The pitch and height of the seats in the east end are also realigned for basketball using an automated multi-million dollar spiral-lift system (a series of giant hydraulic Slinky-type things that move the seats up and down). The court is smaller than the ice surface, so when the ACC shifts into basketball mode, it gains about 1,000 seats, for a total of 19,800. Next, the players’ benches and the penalty boxes are removed from the north and south sides, and seating units are dropped in their place. After installing additional manual seating sections on the east and west ends, the crew starts to put down the court. To make sure it’s straight, a chalk line is drawn on the deck as a guide, and a sledgehammer and block are used to tap the floor into alignment. The installation mirrors hardwood flooring, except the court sections are larger, and each piece is hooked into the one before it. In total, there are 195 sections of court, 13 deep and 15 across. Once the court’s down, the basketball nets are installed and adjusted, and courtside seating is set up around the edges. Out of the sporting events the ACC regularly hosts, hockey to basketball conversions (and vice versa) are the easiest, as the crew has the most experience with them. Lacrosse to hockey takes the least time, as the boards and seating stay the same, while lacrosse to basketball takes the longest. And the worst? Arena football. Concerts can also cause problems, particularly if the tour’s new and the setup hasn’t been tested, or if complex pyrotechnics are involved. 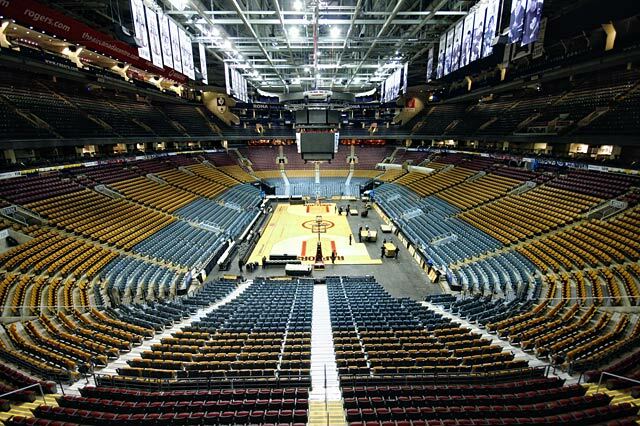 Unlike many sporting venues in North America, the Air Canada Centre doesn’t have much in the way of storage space—a trade-off for being downtown beside a highway, instead of out in the suburbs. To cope, every inch is used to its fullest, which means storing a lot of the equipment under the seating units. Still, the ACC’s space limitations don’t seem to be slowing it down. Unless the Leafs make the playoffs—an event that’s now as mythical as the crew—the ice is usually removed sometime in early May, which, says Wynne, makes summer concert conversions a lot easier. The ice is then built up again in September over a three to four day period. “It’s just like you would do on a backyard rink with a hose, you build it layer by layer,” explains Wynne, adding that unlike most backyards, the ACC has a glycol piping system that runs under the ice to keep it frozen. And once the ice is in, it stays there till the end of the season. During a conversion, the Air Canada Centre feels like a different place. Games are loud and raucous affairs, while changeovers, though not exactly quiet, are eerily calm. (At least the one we experienced was.) So much so, that when you’re standing on the ice deck you start to notice other sights…and smells. For one, the floor reeks of sweat—especially near the players benches, which are just gross in general: littered with junk food, discarded surgical gloves, and bloody tissues. The basketball nets also stink of sweat, which suggests that they’re not cleaned very often. Perks aside, the job, says the crew, comes with sacrifices. “It’s tough on the body,” it’s hard on “relationships,” and it “kills your social life,” they explain. That said, it’s a job they still like. Video shot by Miles Storey and Christopher Drost; produced by Miles Storey.